A family treasure broken? Badly restored or still in pieces after several years? There's a good chance I can fix it. Smashing repairs by a Yorkshire based (Leeds / Harrogate / York area) professional restorer of ceramics, pottery, porcelain & fine china. Willing to undertake restoration work throughout the UK. Full address withheld to ensure security of precious pots and ceramic items. Missing hands/heads/tails etc sculpted and replaced. Old repairs made good (discoloured glues/badly glued together). This list is by no means exhaustive – please ask! Does not have to be antiques – any beloved item you want fixing can be worked on. 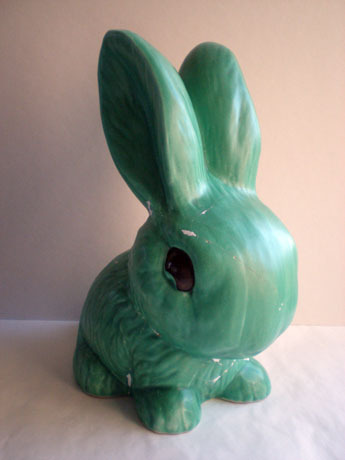 Does not necessarily have to be ceramic (for instance china, pottery, resins or plaster). Are there different levels of repair? Yes, for instance, some items, usually due to their history should not have extensive repair work. They can have a ‘museum ‘ or ‘honest’ restoration. The repair will be obvious but made to look clean and neat. A full restoration is where the item is restored invisibly i.e. you will not be able to see the repair. The choice of the level of repair is yours, following mutual discussions and suggestions from me. Can I use it as before? 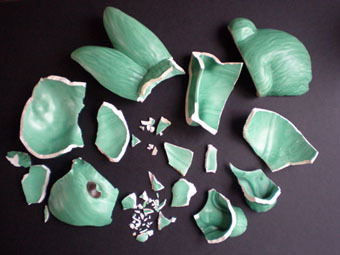 Repaired ceramic items should continue to be handled with care and are for display purposes only. No eating off plates or drinking from mugs! Clean with care. Wiping with a soft dry cloth only. Reassembled with missing areas filled, awaiting painting.